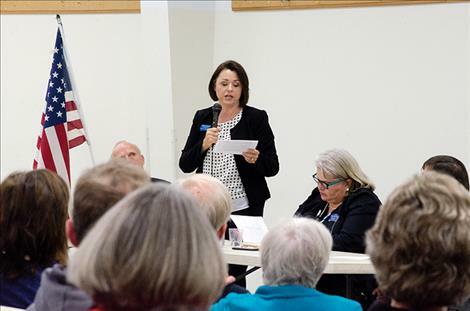 RONAN – Seven candidates for local office spoke directly to the community they hope to lead last Wednesday. 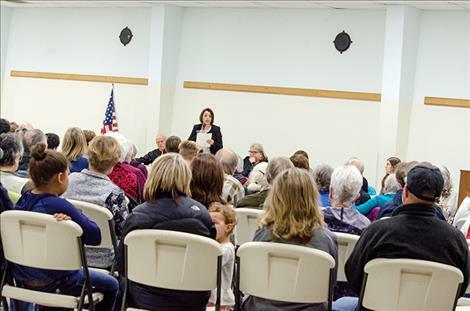 Approximately 100 community members attended the forum, held at the Ronan Community Center. The Lake County Democrats and Republicans sponsored the event. Lake County resident Elaine Meeks attended the forum to improve her understanding of the candidates’ stances on relevant issues. “To hear candidates themselves speak about their positions is helpful in becoming an informed voter,” Meeks said after the forum. Candidates for County Commissioner in Lake County’s District 3 kicked off the forum by highlighting the differences in their approaches. 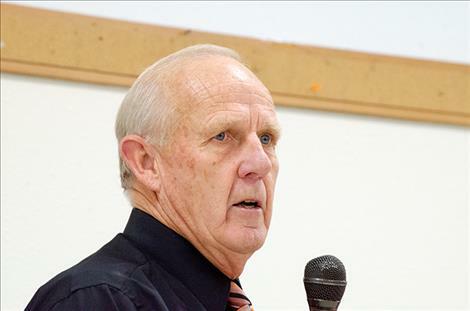 Republican incumbent Gale Decker pointed out that his “number one” goal as commissioner would be to increase the tax base of the county. 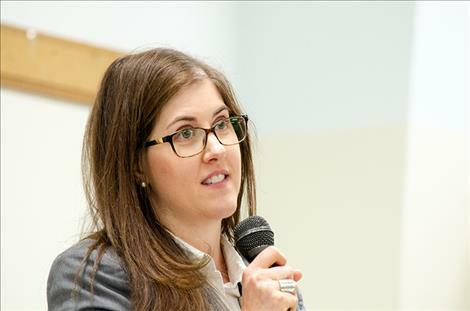 Democratic challenger Caroline McDonald identified collaboration between diverse stakeholders as the focus of her candidacy. “It’s time for us to start working together again,” she said. District 3 is the middle district in Lake County. County commissioners oversee the basic functions of the county government including tax collection, road maintenance, public safety, and land planning. 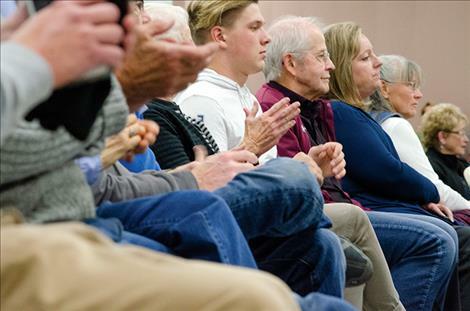 Lively discussion ensued when the candidates were asked about the impact of “fee to trust” land on the county’s budget. Fee land is privately owned and is subject to property tax. Reservation trust land is held for a tribal member or the tribe by the federal government. This land is not subject to state or local property taxes. Decker used a visual aid to explain his understanding of the impact of trust land. He held one end of a stretch of office paper and a member of the audience held the other end. 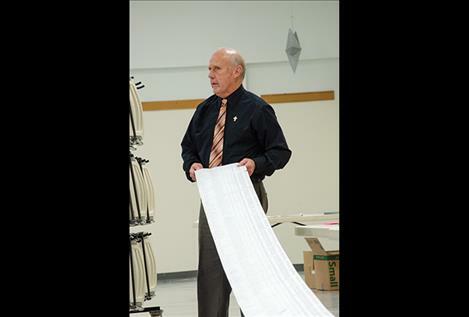 They pulled the document to a length longer than that of the table where the seven candidates sat. Decker explained that the paper listed every tax-exempt Lake County property. Decker said that the list showed that about one third the area of Lake County is not taxed. He advocated for solving the problem by correcting flaws in assessment values and ensuring that exempt properties truly qualify for exemption. “We need to take this burden off of all of those taxpayers,” Decker said. McDonald called the long sheet of paper a “distraction.” She said that contrary to her opponent’s claim, records provided by the Lake County Commission in July 2018 showed that the average loss in property tax value due to land being changed from fee to trust designation was $170,000 per year over the last five years. McDonald said that Decker’s claim that the county was losing $2.2 million dollars each year on land with trust designation was false. “Simply put, the real numbers weren’t upsetting enough so he had to make them cumulative, apply inflation, sprinkle in some creative manipulation, and voila, instant public outrage,” McDonald said. “Why? Because as long as you are distracted by this fake crisis you will forget that he has ignored so many real issues,” she said, listing substance abuse, jail infrastructure, law enforcement, and economics as issues Decker did not address during his term. McDonald said that the way to address property tax shortfalls would be to work with the tribe. 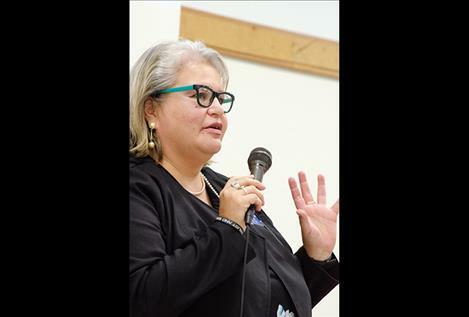 “But the point is you would need a commissioner who has the professional respect of tribal leadership to even enter into such negotiations,” she said. Both candidates said that Lake County’s business reputation needed rehabilitation. McDonald said that the problem was unfairness and favoritism in the business realm in the county. She said that the county could attract outside investment if the tribe and the county worked together on economic development. Decker had a different perspective. “Maybe it’s not the county that’s difficult to work with. 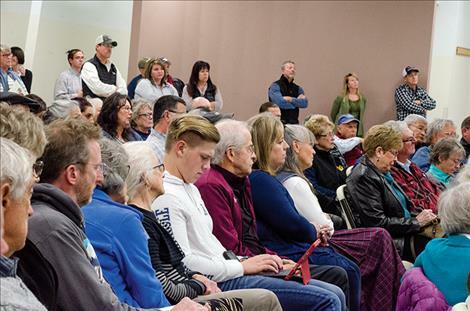 Maybe it’s another government,” Decker said, implying that tribal government was to blame for poor economic growth. He also attributed slow economic activity to a dearth of skilled workers and high property taxes. 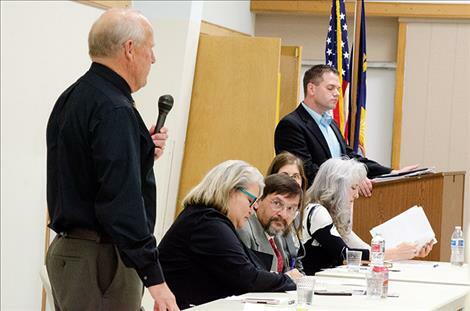 Healthcare, water rights, and substance abuse received attention from candidates for the Montana House of Representatives. The 100 members of the House of Representatives work with the Montana State Senate to make laws for the state. 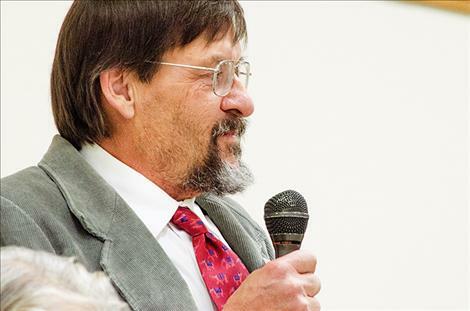 Democrat Eldena Bear Don’t Walk opposes Republican incumbent Joe Reed for the District 93 seat in the Montana House of Representatives. District 93 includes Arlee, St. Ignatius, Charlo, Pablo and Ronan. 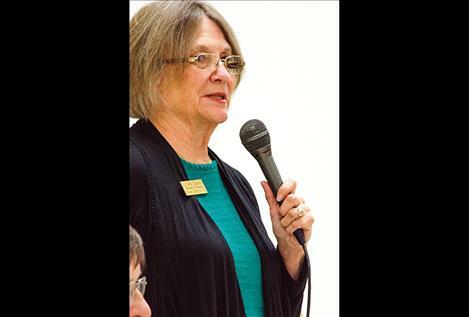 Democrat Susan Evans is running against Republican incumbent Greg Hertz in House District 12. Hertz did not attend the forum. Polson is located at the south end of District 12. House candidates started their portion of the forum by sharing their views on Medicaid expansion. The expansion increases the number of Montana residents who qualify for Medicaid by providing healthcare service to those with incomes up to 138 percent of the federal poverty line. The federal government has fully funded the program until June 30, 2019. After that date, the state of Montana will be required to fund a portion of the program or it will be terminated. Bear Don’t Walk said she was uninsured until she got a job as an adult. “You cannot live your best life without healthcare,” Bear Don’t Walk said. “We have to have Medicaid expansion.” She said that healthcare is particularly expensive for rural residents like those in District 93. 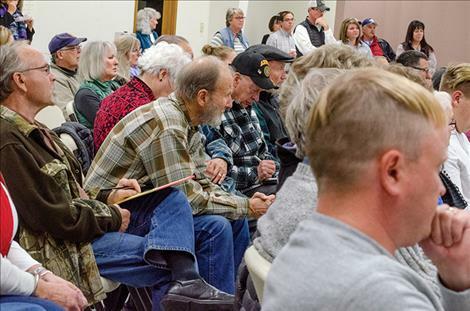 According to Bear Don’t Walk, Montana’s most vulnerable residents are “one health disaster away from bankruptcy” if they do not have insurance. Reed shared his opinion on the fiscal aspect of the program. “We have a state budget that could pretty much be bankrupted if Medicaid expansion is done too aggressively,” he said. He said he thought the expansion would happen, but limits should be placed on the program. Evans lauded the Medicaid expansion for spurring growth in high paying jobs in the healthcare industry. She also said that she was confident that it wouldn’t cause issues in the state budget. “It supports itself,” she said. The candidates shared their ideas for encouraging economic development. Evans and Reed said that the state should close loopholes that allow wealthy Montana residents to avoid paying taxes. Reed advocated for fewer restrictions on natural resource extraction. Bear Don’t Walk said that a tourism tax would benefit the region. She added that small, locally owned businesses should be supported to boost the economy. Bear Don’t Walk said that she would support the CSKT water compact at the federal level as it is written before its expiration in 2019. 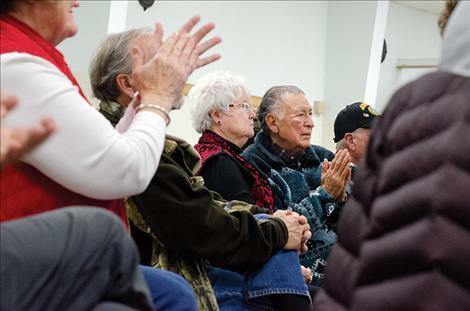 The water compact would settle water rights on the Flathead Reservation. Bear Don’t Walk told the audience that the costs would be great if it was not approved. “If it does not go through just remember it’s your money that you’re going to invest in decades-long lawsuits,” she said. Reed said he would not support the water compact as it is written. “This has to be re-voted on,” he said. Reed added that an immunity clause included in the water compact did not pass with three-fifths of the votes in the legislature, which he believes makes it invalid. When asked about the greatest challenge facing the local judicial system, Bear Don’t Walk addressed the cost of incarceration. “If you want to incarcerate more people, you want to punish them, you want to send them to prison, alright. But you need to be willing to pay for it,” she said. 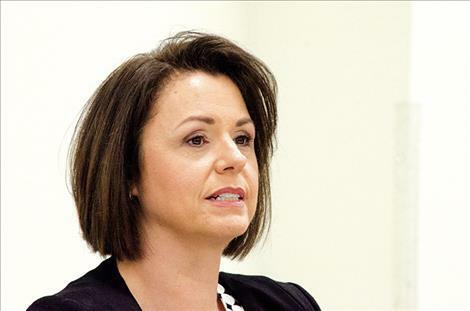 Reed said that after substance abuse, the next biggest challenge was a lack of available information about candidates for district court judge. Incumbent Judge Kim Christopher has served as Lake County’s District Court Judge for the last 18 years. Her opponent is Ashley Morigeau. District judges conduct criminal and civil trials. The race is nonpartisan. 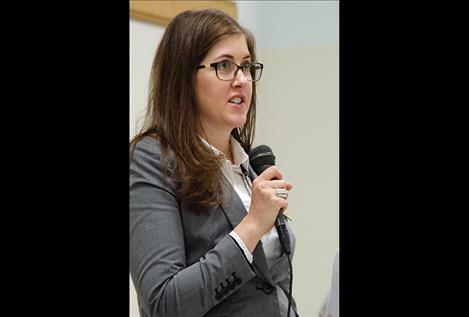 Morigeau, a public defender, said she would take a community-oriented approach to the position. “Everything that happens in the courtroom has an impact on what happens in the community. Sending someone to prison creates the absence of a parent, child, friend, or neighbor. Custody decisions impact many people including the children who are the subject of those proceedings,” she said. Christopher said she does her best to use the power vested in her by the community to exhibit her “proven experience and uncompromising integrity.” She touted her experience as district court judge and as a judge in the military. When asked about her approach to imposing sentences, Christopher said she adhered to sentencing ranges. “It is the judge’s responsibility to determine where in that range is an appropriate sentence,” she said. Morigeau said as a judge she would consider aggravating and mitigating factors in sentencing. She said that she would consider mental health, chemical dependency, and prior criminal record. She also said she would consider the impact of a crime on victims or family members. “I don’t like the idea of having a one size fits all policy,” she said. Morigeau said her approach to solving problems with drug crimes in the region would focus on expanding drug treatment courts. This alternative to incarceration provides treatment for those who are addicted to drugs. “In many cases, the best method of dealing with people is not incarceration. It’s rehabilitation,” she said. 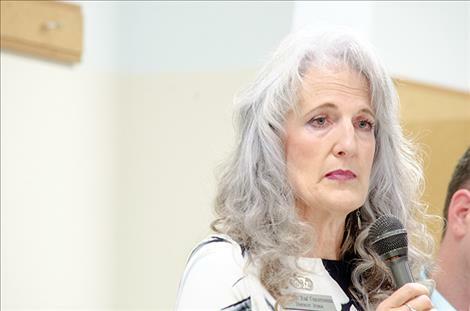 Morigeau said it is important for a judge to understand factors like mental illness and childhood trauma, which could be part of the reason for chemical dependency. If elected, Morigeau said the biggest change she would make to the courts would be to expand drug treatment court. 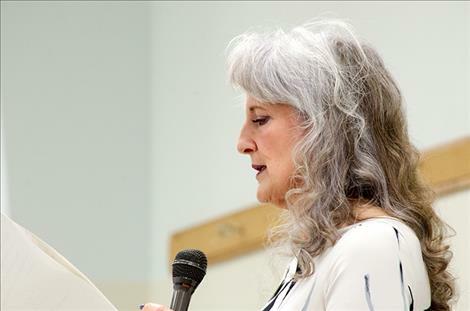 “If I’m elected I will consider alternatives to Department of Corrections,” she said. Christopher took a harder line on drug offenses. She said that she agreed that mental illness and addiction were often factors in criminal cases. However, she said that while mental illness “is not a choice,” using drugs is different. “You’re making a decision that potentially compromises the safety of the public and that’s one of the first things criminal law is supposed to do: to protect the public,” she said. Christopher said that her approach to reducing the number of people involved in the court system starts with the children who are impacted by her action as a judge. “Where I begin is to try to keep people from ever going that direction,” she said. Christopher said that the Court Appointed Special Advocates program, which she has helped to implement during her time as judge, is one way that she supports children affected by the court system. The program provides guardians “ad litum” who advocate for the needs of neglected children in the courtroom. In her closing statements, Morigeau pointed out her dedication to seeking innovative, creative solutions. Christopher highlighted her experience by reading advice she received from a mentor she received 18 years ago when she was first elected to the position. 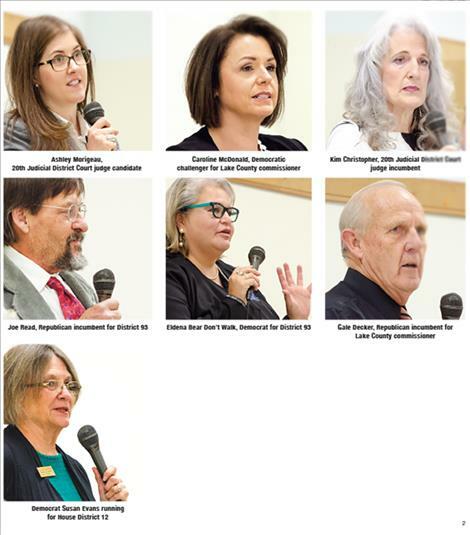 There will be another candidate forum on Wednesday, Oct. 17 at the North Lake County Public Library in Polson at 6 p.m. Elections will be held November 6.